Opera Mini updates are usually a good thing. They include bug fixes and often, new features. But for a few users, usually with old or obscure phones, the new version doesn’t work as well as the old one or work at all. On the Opera Mini User forum there is a recurrent theme of users, trying a released version and insisting that one of older ones, was better. There’s a sticky post on the forum with links to some old versions but it’s far from complete and doesn’t include beta versions or signed ones. I can understand Opera wanting users to be on the latest version, but when that version doesn’t work it’s nice to have the option to roll back to an older one. 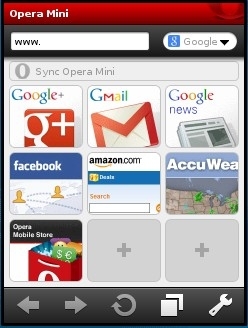 I’ve gathered up all the Opera Mini 5 versions I’ve been able to find and linked to them below. These are all English language versions. Java phone users should try the JAD link first and if it doesn’t work try the JAR. If you get an expired certificate error installing one of the signed versions, try setting your phone’s date back a year or two. Be sure to set the date back to the current one before trying to run Opera Mini to avoid getting a “Verification of server certificate” error. The ZIP files are for use with BlackBerry Desktop Manager. I don’t have the other signed Java versions or OTA files for BlackBerrys. If and when I find them I will post them here. If any readers have copies of the missing versions and are willing to share them, please leave a comment. Updated 5-Oct-2012: Originally published in October 2010, this post is still one of the most popular on WAP Review. Today I went through some old download directories and added over a dozen more old Opera Mini versions. This entry was posted in Opera Mini Tips and Tricks and tagged old versions, Opera Mini by Dennis Bournique. Bookmark the permalink. I have opera mini 8 but when i click on download, It stops working and nothing happens after that.why such thing happens? Pls I need an assistance on how should I download operamini on my bb bold. Because I try 4 several times I could’t. Download the .zip files to a PC, extract their contents and install using BlackBerry Desktop Manager. You can also download the current version of Opera Mini for BlackBerry by going to http://m.opera.com with the BlackBerry’s browser. I’m looking for opera mini 6.1.jar signed version like ovistore has (java permissions full access). Can you provide it or give a download link please ? I’m sorry but I don’t have 6.1 signed. If you want to relieve replies by email, tick the “Notify me of followup comments via e-mail” box on the comment form. I want 2 download it,bt is nt able to, smbdy pls hlp..
What phone are you using and what error do you get? Open this post in your phone’s browser and click the jad or jar link. i have a BLU Samba Mini,how do i get opera mini 5.1 ? Open this page in the phone’s browser and click the Opera Mini 5.1 JAD link above. Did you try what I said? Did it work? If not what’s the error? My cell is Nokia 3110c. I use Opera Mini 5. I’m unable to download any image files in my cell via this browser. Every time I try to download something, it says, “application set to not allowed”. Plz help. In the Java menu highlight Opera Mini, press options and then suite settings. Set the permissions for write user data and read user data to any one of ask once, ask always or always allowed. If those choices aren’t available you need to download a signed version of Opera Mini. I’m not aware of any restrictions on distributing freeware such as Opera Mini. If Opera Software believes otherwise and asks me to remove the files I will. Try downloading with the UC Browser or the built in browser. If Opera 6.5 and 4.4 were working before, they should still work. What error do you get when you try to install or run them? Please cannot access my operamini5 beta2 on my INQ chat 3G phone. It cannot even load. If it’s a connection error see Solving Opera Mini Connection Problems. WHEN INSTALLING OPERAMINI SOFTWARE, “JAVA ERROR,CONTENT SIZE TO LARGE”OCCURED IN MY SAMSUNG GT E 2232.Why these types of error occured ? how can l prevent these? tell me the right way to me? You need to use BlackBerry Desktop Manager to install the BlackBerry version posted here. Can you please send assist me with a link that can assisrt me download irt succesfully. The signed Opera Mini 5 Beta 2 is posted on this page, The others I don’t have. Sites give you upgrade browser messages when using a mobile browser because they are badly designed and expect everyone to be using a PC with IE, Firefox, Safari or Chrome. Nothing you can do about that except complain to the site’s support email if they even have one. You can’t install or upgrade certificates on non-smartphones like the Banter. As far as I know, the LG Banter Touch for MetroPCS supports installing Java apps like Opera Mini. So you can’t install Opera Mini or any other browser unless there’s one offered through Metro’s apps store. I can’t download opera mini for my BB curve 8520. It shows overflow error b or C. What can I do? Be sure your BlackBerry browser’s emulation mode is set to BlackBerry not IE then download Opera Mini from http://m.opera.com using the BlackBerry browser. 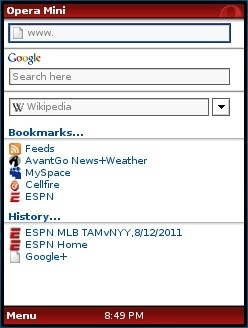 All the old versions of Opera Mini I have are posted above. I don’t have a signed version of 5.0 and haven’t been able to find one either. Thank you so much for making this available. I love Opera 6, but it has a terrible load time and has been wreaking havoc on my phone’s battery life. I dont know why Opera Mini 6.1 is not working on My Samsung Champ 3303. Should I try 5.1 beta? Do i have opera mini on my cherry mobile Q3i? please help. Unless you’ve tried it already and it didn’t work, I’d try downloading the latest Opera Mini from http://mini.opera.com Also there’s suposed to be a new version of Opera Mini coming out tomorrow. Hopefully they fixed some of the BlackBerry issues in this one. If you expect anyone to help you need to stop SHOUTING and explain extactly what happens when you try to launch Opera Mini 5. Opera Mini 5 beta or later is useless on a Torch 9800. Sensitivity is unmanagable. I have a 9700 that has problem with Opera Mini 5 navigation not working. The BB OS is v5.0.0.34 which is not listed here. Will I just have to wait until version Opera Mini 5 has been fixed? You can’t use the generic jad and jar files with a Blackberry. Download the zip for your BlackBerry OS version, extract the files into a directory and install then with the BlackBerry Desktop Manager. Tried loading through Desktop Manager for Mac to Bold 9650, but it would never finish “preparing applications.” I can’t find a way to download only the one application. Any helpers? I’m not a Mac user so I’m afraid I can’t be much help here. This article: http://blogs.blackberry.com/2009/09/blackberry-desktop-software-a-closer-look-at-the-mac-os-version/ has some information. It looks like you click the “Applications” icon in the top right of the main screen, then click the “Install Remove Applications button”, then click the plus sign icon to add individual apps. I don’t think anyone is as excited as I am! I gave looking for the beta versionszb thanks a lot! thank u soo muchh.. i was looking for the beta version of opera mini for days.. atlast i found here..